Adolf Hitler was gunned down in 1944 in a Parisian cinema in the closing scenes of Quentin Tarantino's Inglourious Basterds. That pivotal fictional event is linked to the director's other films, say fans - the son of one of the Basterds appears in Tarantino's True Romance. It's just one of the many links and influences that turn this set of movies into windows on an alternate world brought to life by the fast-talking director. It means Hitler's death in the cinema is shared across the films in the same way that many of his movies share fake brands such as Red Apples cigarettes and the Big Kahuna Burger chain of fast-food restaurants. That common back story is just one example of what is known as trans-media - something the web has made increasingly common. Like its name suggests, trans-media happens when a story transcends the narrow confines of a single telling, be that in a book, a comic, on film or in any other media. "People use that approach because it helps extends their stories over timelines and territories so it can span the real world and the digital world," said Alison Norrington, a writer who uses and teaches trans-media techniques. Trans-media is the reason why there is often a game of the movie, or a spin-off book, TV series or cartoon. Trans-media explains all those sequences that ran after the credits in Iron Man I and II, Captain America, and Thor that helped pave the way for the movie that brought them all together - Avengers Assemble. Crossing those boundaries online and in the real world was useful, said Ms Norrington, because it could help a project live longer than it otherwise would. It also helped an audience engage with a story they liked and wanted to find out more about, she said. Both can help creators cultivate an audience and generate a bigger return, be that financial or creative, from the stories they fashion. In many cases those uses of trans-media, which can involve fan fiction, alternative reality gaming or online communities, flesh out and enrich the world depicted in the book, movie or show that started it all off. The biggest projects involving the largest fictional properties, such as the galaxy depicted in Star Wars, employ lore watchers who ensure that the story stays consistent across its many re-tellings. Some creators, such as game makers Raphael Colantonio and Harvey Smith, have approached trans-media from the other end. In their creation, video game Dishonoured, players only get to see a fraction of all the work the designers did on the world in which it is set. "In any given play-through, we think you see about 30% of the content," said Mr Smith. Dishonoured revolves around the attempts of royal bodyguard Corvo Attano to clear his name after being framed for murder. The game's flexibility means players can choose how they do that. Some carve a bloody swath through the city of Dunwall as they search for answers, others eschew violence altogether and use more subtle ways to expose the real murderers. Creating a virtual environment in which those paths, and any in-between, could be explored was less about video game design and more about creating a rich world, said Mr Smith. 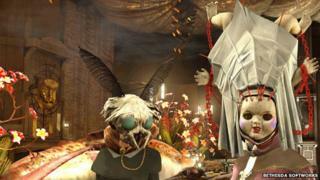 It involved the designers knowing almost everything about the game's dismal steam-punky setting. Everything from the calendar to the foods its inhabitants eat to the religion they practise. "It's our strategy on every project to make the world bigger than the game," he said. "You meet a character in the world and it inspires a back story, perhaps they used to know the other side of town when they were young. None of that is in the game but it adds layers to it." The strategy helps re-playability because it means when players chat about Dishonoured they realise what they missed and go back to try to find out more. "It's part of the magical process where you go through the world exploring and perhaps getting to roof tops you didn't think you could reach," said Mr Smith "In those actions you have a great sense of agency. You're not in a hallway pushing buttons given to you by the designer." Not all works lent themselves to being exposed and enhanced by getting the trans-media treatment. said Ms Norrington. "Not every story should be told this way," she said. "There's a danger of over-exposure. You need to know that your story can stand more than one telling and that it is ripe to be extended." For novelist Jean McNeil, who has collaborated on multimedia works, there was one category, literary fiction, that definitely should not get that treatment. "That kind of fiction does not need to exist, except for the fact that someone wants to write it," she said. In that sense, she said, its intent and emotional intensity meant it had more in common with works of art than with more mainstream fiction. "With literary fiction there's no pre-existing expectations about where the narrative is going to take you," she said. "It's ambitious in a way that genre fiction isn't." It was also interactive in a way that writing read on a screen was not, she added, and engendered a very different reaction. "It's more about what is it going to do to a reader's mental landscape," she said. "The actual reading experience asks you to forget the world." That immersion, said Ms McNeil, was much harder to achieve in other media. "It's worth paying for that to have your cultural and mental landscapes broadened," she said. Despite this, said Ms McNeil, there were real benefits in a writer using the web, social media and other tech tools to reach out. "The publishing world has become cacophonic and something of a free for all," she said. "I'm all for change and innovation because it helps writers find readers."